The entire day has passed by, and I have not moved a muscle. I have been sitting here all day, awaiting ‘his’ arrival. I know he will be here. He always does. In the past few years that we have been together, not a day has passed by, when he has not graced me with his presence. But, today, there is a restlessness that I have been feeling since the past few hours. What must be the reason? I wonder, when out of the corner of my eyes, I see him approaching. My heart skips a beat; I forget to breathe. I smile coyly, as my eyes take him in. Oh, how I missed him! Where had he been all this time? No. I won’t hold grudges. He has been late, by just some hours. Must have been held up somewhere. My entire being comes alive, as his feet carry him near me. I blush. I flush, in the darkest shade of pink, and lower my eyelashes as the distance lessens between us. And, as I look up at him, with love oozing from my eyes, he passes me by. I am taken aback! “Hey! I am here, sweetie!” I call out to him, but the words get stuck in my throat. Did he really not see me, or was that a royal ignore? I am stunned! I am dumbfounded! I wonder what the matter must be, as my eyes follow his movements. And, what do they see? He, approaching ‘her’! My heart stops beating and my breath fails me. I struggle to gather myself. Helplessly, I look, as he moves closer to her and smiles a dimpled smile. His hands reach out to her. Broken hearted, I see, as he caresses her every curve, all the while cooing sweet nothings into her ears. I can take it no more. That was me, sometime ago. And, now I am all but forgotten?! He moves in closer, and plants a seductive kiss on her cheeks. “Let’s paint the town red, baby!” he whispers, as they get comfortable in each other’s arms. She moans and she purrs, as she warms up to him. And, before I come to my senses, they zoom off into the sunset, giddy with excitement. Life in a garage can be so boring. You won’t know. You aren’t an old car, idling, rusting, ignored by it’s owner for a swanky new machine, that seems to have caught his fancy. Ah! How I miss those good old days! That’s all there will be to life now. Reminiscing about our good ol’ days! This week’s prompt: Sentence prompt. Let’s paint the town red. This week’s prompt comes from writer, social media enthusiast, B-A-R member: Sulekha Rawat. And fractions drive me mad. It has been more than 40 years, since I heard these lines being recited by dad, but I still remember the tune to which dad had set the rhyme. And, I vividly remember, he would emphasise on the last word, MAD, stretching it so, it left me awestruck! I think, he predicted back then that one day, his daughter is going to be struggling with arithmetic and its siblings, pulling her hair out in frustration, and driving him and mum crazy! I still have that wonderful book with me. Long ago, when I had been to mum’s, I fished it out of the attic and brought it back. Dad suggested passing it on to my nephew, but I would have none of it. It was MY book, it would stay with ME! Today, when I see the rhyme books available in the bookshops, I feel proud for having owned a book that was so royally printed and lovingly bought for me by my dear dad. The illustrations are ‘royal’ , with kings and queens and young lads and little girls, all dressed in the attire of the Victorian era. Some of the rhymes will seem familiar to kids of today, but, there are others that, I feel, belonged to that period. I couldn’t sleep for a long time last night. I was lost in my childhood, with dad reciting the rhymes, and I, staring open-mouthed at the marvellous book, lost in those colourful pictures! I plan on going through the book today, and call up dad and thank him for his gift of a lifetime! Here’s the picture of the illustration made for the poem. 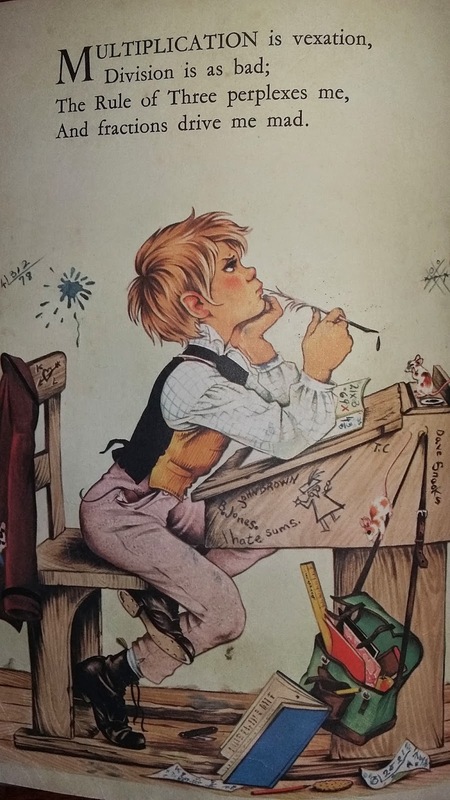 The boy, sitting at his desk, lost in thought, is how I was, back then, when faced with the most hated subject of my school life! Life today, is so fast, and so glamorous. It makes me yearn for the simple days of my childhood. I pity the children of today, who have everything they could ever ask for, except the simplicity and the innocence, that we were abundantly blessed with. Thank god, I have these golden memories to cherish, and sustain me throughout the rest of my life! Will call up dad now, and take him for a walk down memory lane! Couple days ago, I found myself down in the dumps. Figuratively, of course. Some words, spoken by a loved one, hurt me badly. They may not have been uttered with an intention to hurt. Also, I may have been in a bad state of mind, for, I ended up bruised. It may have been the doings of my crazy hormones, that seem to be playing havoc with my mind, of late. Now, here is something I would like to ask my girlfriends, who have been through the forties, been there, done that. Do hormones really do that to you? At this age? Leave you all emotional, sentimental, extra touchy and vulnerable? It is something that I really want to know. It sure will be a solace knowing I am not alone. Of course, I know I am not alone. Every one goes through this phase. At times, I wonder, am I nearing the big M?! And, if I am, then, how long do I have to travel through this horrid phase? I really need all the help, the feedback, I can get. Because there are days when things are BAD! Okay, so, as I was saying, that is how I was, couple of days back. Depressed, disturbed, and feeling worthless; yearning to speak to my best friends, who at that hour, seemed unavailable. However, as luck would have it. one of them was there, on FB. All I asked of that kind soul was to give me a pep talk, no questions asked. And, I got what I wanted! A few words uttered by my lovely friend, at the exact moment, totally changed my emotional state. I had a smile, coupled with a few tears of relief. I was overwhelmed! And, felt so lucky to have someone, when I was in dire need. A big, warm hug to you, P! 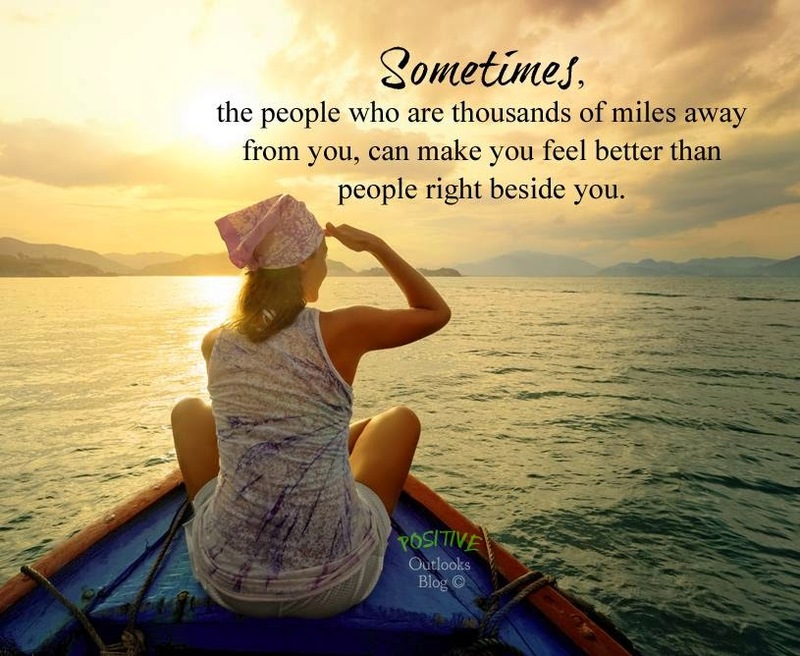 And, then I came across an apt quote, which I dedicate to all of my besties! And, then, I also came across another quote, posted by a fellow blogger, which seemed to be written and posted just for me!I have saved it, and am going to visit it every now and then. In fact, I think you all must save it and read it every time you are in the same position I was in — down in the dumps! Today, I got a call from another of my bestie, who gave me a piece of her mind, asking me to dump all the feelings of worthlessness in the garbage bin, pat my back, and move ahead, with a smile. And, I am doing just that. And, feeling so much better. And, thanking my lucky start, for blessing me with my ‘darlings’! This year, Valentine’s Day has been pretty unique for me. Some days ago, I happened to chat with a fellow blogger, Cat Graham. She, too, like me, is a member of B-A-R, a blog created by the very talented Shailaja Vishwanath; it’s because of her that I could meet so many lovely people and make friends with them! So, as I was saying, Cat and I, we just happened to ‘click’, instantly! Mostly, because of our love for sketching. So, on her suggestion, we are hosting each other on our blogs, to celebrate this lovely day and mark the beginning of a new friendship. She has been gracious enough to share a couple of her fabulous sketches. And, I must say, she is simply fantastic! I am also sharing the link to her blog, so that you all can visit her and get to know her. Here’s to a great start. Looking forward to sharing many more posts and sketches by this fine artist! In honour of Valentine’s Day, Shilpa and I decided we’d celebrate our new friendship by doing guest posts on each other’s blogs. Shilpa and I both enjoy sketching and we both love our big dogs. She has a big dog Cheeko and I have a big dog, Loup. Loup is an Alaskan Malamute, a true snow dog who actually enjoys our freezing Canadian winters while all the rest of us are longing for spring. I decided to draw a cartoony type picture of my dog, Loup. 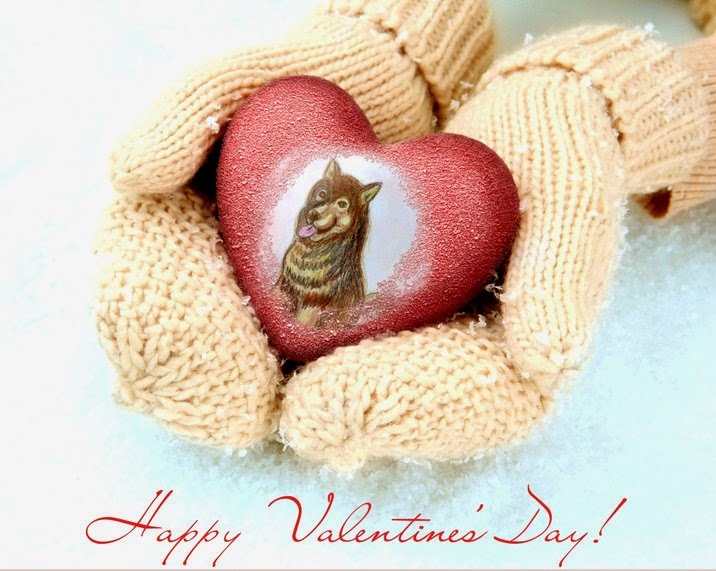 In celebration of Valentine’s Day, I took the picture, scanned it and put it into a Valentine’s template at the online photo editing site ofhttp://www.funny.pho.to.com. I think it turned out very cute. Thanks to Shilpa for letting me do a guest post on her blog. Here’s to our new online friendship that connects us despite the immense geographical distance between Canada and India. Shalini sat at her dressing table, surveying the changes her face had undergone during the five odd decades of her life. She tucked back a tuft of greys as her eyes fixed on the laugh lines. They had become quite prominent in the past few years. “But, they are laugh lines, Shalini. And, that means you laugh a lot! Don’t you now, Professor?” Vipul had chuckled, making her blush a deep red. Dr. Vipul Mehra, her dentist, who had seemed quite frosty initially, had soon warmed up to her and become an integral part of her life; a support system she had lacked all these years. A lonely soul, who had lost his wife to cancer, Vipul had charmed Shalini with his wit and humour. She had experienced unbridled joy after so long! Life with Vinod, her husband, had been a happy one till the horrifying accident, which had snuffed out that happiness in one single stroke. She had laboured night and day to bring up their only daughter, Juhi, singlehandedly. She had fulfilled her dual responsibility towards her daughter in the best way she could. But, once Juhi got married and flew the nest, Shalini had felt a vacuum engulf her. A vacuum that Vipul had filled up with his boundless zest for life and, of course, his contagious laughter. She now gazed at her husband’s picture with a question in her eyes. A question she was too scared to ask herself! Would she be too selfish, if she now dared to think of herself, her happiness? Would society accept her decision to begin her life afresh, at an age when people thought of retiring from their’s? And, most importantly, did she have the permission to fall in love at this age? Her phone rang, snapping her out of her thoughts. She smiled as she saw the caller’s name. “Hey, Prof, how ’bout a date with your doc, hmm ? 7 pm, at the clinic. Your throne awaits you, Your Highness! And, your old tooth fairy has got a crown…for your tooth!” She burst into a peal of laughter, which filled up the room as she made up her mind. This week’s prompt comes from the three B-A-R members: Shalini Nair, Sulekha Rawat and Sheethal Susan Jacob.